Precision-machined punches and dies require maintenance with proper grinding wheels and a coolant, as heat is a primary cause of wear. 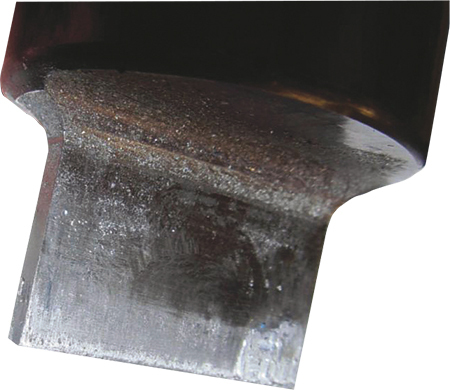 To increase the life of punching tools, fabricators must understand the reasons why tools wear prematurely. While there are many, for this article we will focus on three. The number-one reason why tools wear prematurely? Improper die clearance, whether too tight or too loose. This fact requires that machine operators understand the physics of punching presses. Too tight of a die clearance is hard on the punch, causing it to wear quickly. Galling also occurs as the punch rubs against the hole. Tight die clearance also increases the required punching tonnage, resulting in increased press maintenance and effort. Too loose of a die clearance causes the die to wear more quickly because material rolls into the die before fracturing occurs. The result: excessive burrs, deposited debris and part deformation. An understanding of press physics will allow companies to avoid these mistakes. Numerous factors are involved with punching a hole in the center of the die: shot pins, bores, guides, punches, lower-die holders and auto-index stations. All of these provide opportunities for turret misalignment. “Saw toothing,” or burrs on one side of the hole or wear on opposite sides of rectangles, can be a clear indication of machine misalignment. This excessive wear, applied to the machine, leads to premature tool wear. 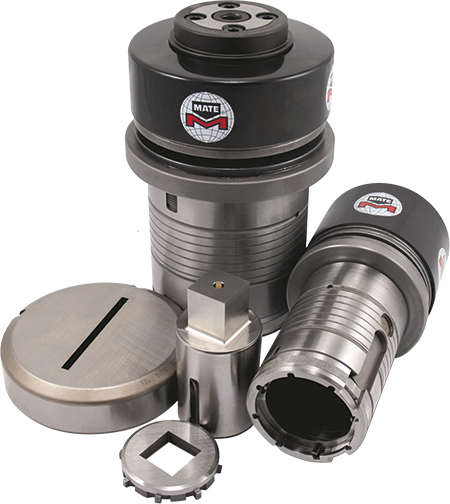 Routine machine maintenance that includes realignment should result in higher production and longer tool life. Too tight of a die clearance causes the punch to wear quickly, as shown here. Turret misalignment leads to premature tool wear. With proper programming, many machines and tools achieve 500,000+ hits. Even so, tools wear. Instead of pulling the tool at 550,000 hits and taking off 0.030 in., it is better to pull the tool at 500,000 hits and grinding off 0.005 in. It only makes sense that precision-machined punches and dies require precision cutting. The tools used in the machine have specific grinding requirements. Maintain them with proper grinding wheels and a coolant, as heat is a primary cause of wear. Information for this article was supplied by Mate Precision Tooling, Anoka, MN; 763/421-0230, www.mate.com.